Now that we have our features selected and scaled, we will go ahead constructing our logistic regression model. Datasets our can be split into two or three parts while creating the model. They are namely train set, validation set and test set. Train Set: The dataset used to learn the patterns and build our prediction algorithm. Validation Set: The dataset that is used to check the performance of the prediction model created using the training set. Test Set: The dataset, which is unseen, on which the prediction model will be tested. 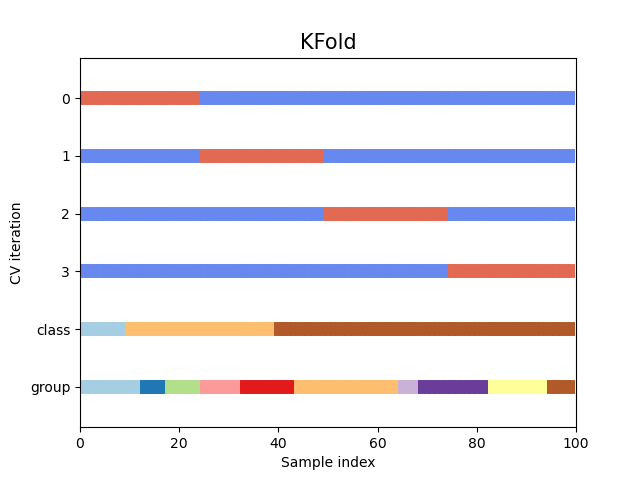 In this tutorial, we will perform K-Fold Cross Validation which splits the dataset into training set and testing set over multiple iterations; in this case, K iterations. A simple graphical illustration of cross validation is shown below. To understand what the above statement means, anyone earning more than 50k is what we will try predicting and hence assign classes of 1 and 0 that correspond to less than 50k and more than 50k. y_true is a common terminology for the ground truth which is how our actual event turned out to be. y_pred is another common terminology for predicting y_true as accurately as possible. Let us create a variable y_pred by copying y_true but will eventually replace y_pred with predicted values. To go through all these parameters is beyond the scope of this tutorial. Hence, I would request readers to check out the scikit-learn documentation to dive further into what they all mean. Similarly, you can also check out other algorithms to explore further. Like classes, you can also predict probabilites by replacing clf.predict with clf.predict_proba. Now that we have y_pred and y_true, in the final part of the tutorial, we will see how our model has fared.